The Wnt signaling cascade is critically important in stem cell biology, both in homeostatic maintenance and repair and regeneration of tissues and organs, through their respective somatic stem cells (SSCs). However, aberrant Wnt signaling is associated with a wide array of tumor types and Wnt signaling is important in the so-termed cancer stem cell/tumor-initiating cell (CSC/TIC) population. The ability to safely therapeutically target the Wnt signaling pathway offers enormous promise. However, just like the Sword of Damocles, significant risks and concerns regarding targeting such a critical pathway in normal stem cell maintenance and tissue homeostasis remain ever present. 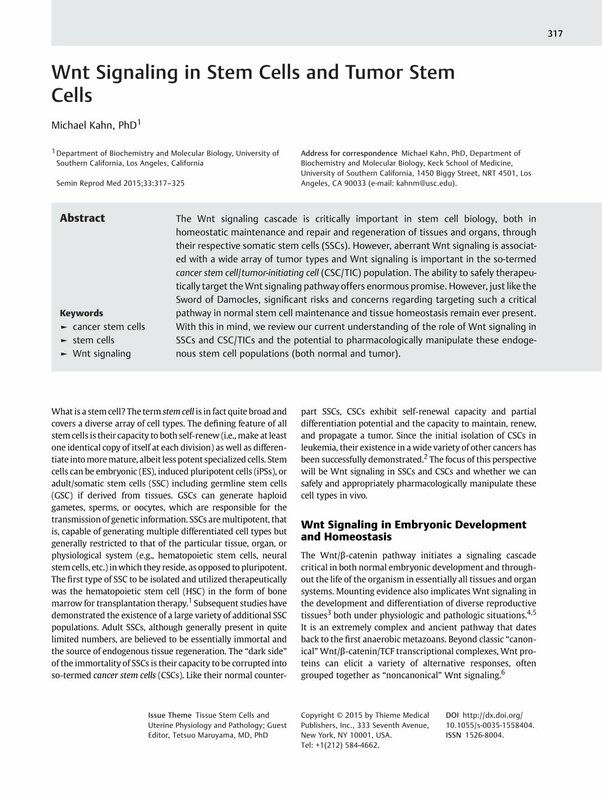 With this in mind, we review our current understanding of the role of Wnt signaling in SSCs and CSC/TICs and the potential to pharmacologically manipulate these endogenous stem cell populations (both normal and tumor).